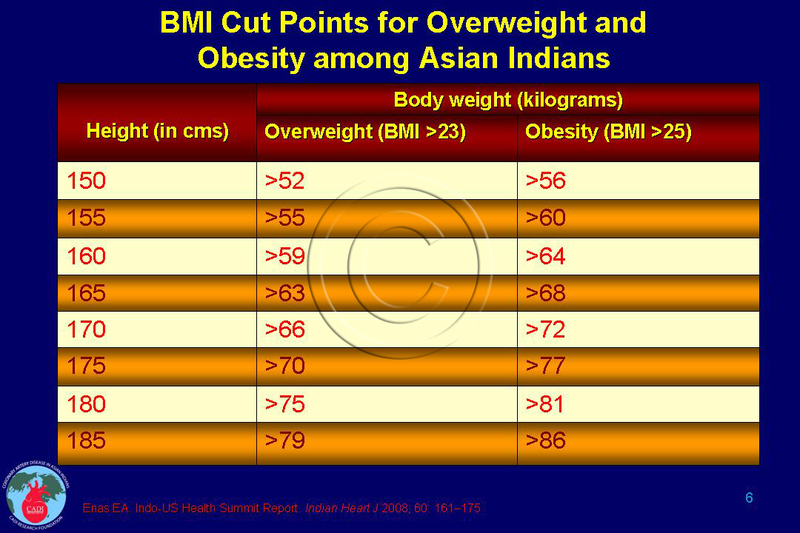 Recent studies using Indian specific criteria for overweight (BMI> 23), obesity (BMI > 25), and abdominal obesity (WC>90 cm in men and >80 cm in women) have found the prevalence rates among Asian Indians exceeding those in the US population.4 The age-standardized prevalence of generalized obesity in South India was 46% (women: 47%; men: 43%) compared to 35% in the US.4 The cut point for overweight and obesity for Indians at various heights in cm is given in Table 006. Abdominal obesity was found in 47% – 51% with higher rates in women (women: 56%; men: 35%).4, 5 Among 5% of men and 14% of women, abdominal obesity was found with normal BMI (isolated abdominal obesity).4 Abdominal obesity measured as WC is a better marker of obesity-related metabolic risk than BMI among Indians. Although the prevalence of risk factors in general is higher in South India a recent study from North India shows a remarkably high prevalence of obesity and abdominal obesity in young Indians (age 36 year). 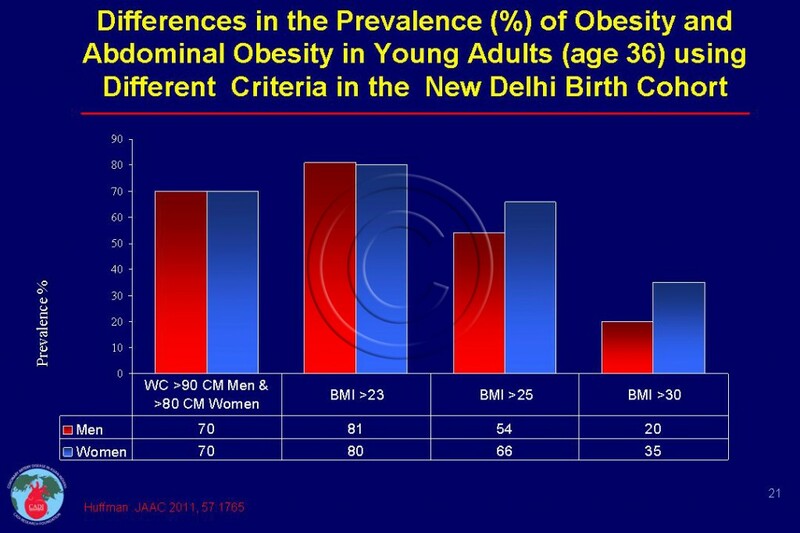 In The New Delhi Birth Cohort, the prevalence of obesity was 20% in men and 35 % in women using BMI >30 as the cut-off point but increased to 54% in men and 66% in women when BMI >25 was used. More than 80% were overweight (Figure 021). 6 This data clearly demonstrates the significant underestimation of obesity related risk among Indians when using the standard criteria developed for the Europids. Despite a high prevalence of obesity (one half of men and two-third of women), most Indians do not consider themselves as obese. The acceptance of obesity is like saying OK to smoking. Mass education of both medical community and the general public regarding the dangers of obesity as well as the lower cut points for defining it is urgently needed. 1. Subramanian S. V., Smith GD. Patterns, distribution, and determinants of under- and overnutrition: a population-based study of women in India. Am J Clin Nutr. Sep 2006;84(3):633-640. 2. Misra A, Khurana L. The metabolic syndrome in South Asians: epidemiology, determinants, and prevention. Metab Syndr Relat Disord. Dec 2009;7(6):497-514. 3. Misra A., Khurana L. Obesity-related non-communicable diseases: South Asians vs White Caucasians. Int J Obes (Lond). Jul 20 2010. 4. Deepa M, Farooq S, Deepa R, Manjula D, Mohan V. Prevalence and significance of generalized and central body obesity in an urban Asian Indian population in Chennai, India (CURES: 47). Eur J Clin Nutr. Feb 2009;63(2):259-267. 5. Misra A, Pandey RM, Devi JR, Sharma R, Vikram NK, Khanna N. High prevalence of diabetes, obesity and dyslipidaemia in urban slum population in northern India. Int J Obes Relat Metab Disord. Nov 2001;25(11):1722-1729. 6. Huffman M D, Prabhakaran D, Osmond C, et al. Incidence of cardiovascular risk factors in an Indian urban cohort results from the new delhi birth cohort. J Am Coll Cardiol. Apr 26 2011;57(17):1765-1774. 7. Bhardwaj S, Misra A, Khurana L, Gulati S, Shah P, Vikram NK. Childhood obesity in Asian Indians: a burgeoning cause of insulin resistance, diabetes and sub-clinical inflammation. Asia Pac J Clin Nutr. 2008;17 Suppl 1:172-175. 8. Misra A , Chowbey P, Makkar B. Consensus statement for diagnosis of obesity, abdominal obesity, and metabolic syndrome, for Asian Indians and recomendations for physical activity, medical and surgical management. JAPI. 2009;57:163-170.